Connect your HDMI devices, up to 20m away with no signal loss. 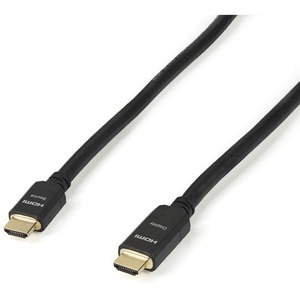 This active HDMI® cable offers a connection distance of up to 65 feet (20 meters) between your HDMI enabled devices. It meets CL2 rating safety requirements, so it's ideal for in-wall cable runs in your home and office installations. The HDMM20MA is backed by StarTech.com's 2-year Warranty for guaranteed reliability.